Can Zam park is in the Barcelona greater metropolitan area and it is now home to timber modular classroom for environmental education. Can Zam park is in the Barcelona greater metropolitan area and it is now home to timber modular classroom for environmental education. Aula K by BCQ Arquitectura is an elegant manifesto of architectural and economic sustainability and targets a cross-cutting audience. The municipality of Santa Coloma de Gramenet, a suburb of the Barcelona metropolitan area on the southeast side of the Catalan Coastal Range and the ninth most populated city in Catalonia now has a new structure designed to make people more aware of environmental problems: Aula K. The project is by Catalan-based studio BCQ Arquitectura and the building was named for local teacher and activist, Isabel Muñoz Moreno. It is the outcome of a partnership between the Municipality and the metropolitan area of Barcelona with the common goal of contributing to education in favour of biodiversity and respect for the natural environment. 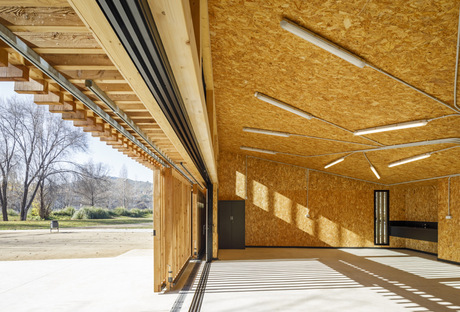 Of course, with a programme like this, a virtuous example of sustainable construction was a must so BCQ Arquitectura came up with a timber prototype for the Environmental Education classroom that could be repeated in other locations in the Barcelona park network. Aula K is a multifunctional space mainly focusing on specific environmental activities for school groups and families: a truly educational space that leverages the park's environmental aspects as well as the nature around it to foster learning and discovery. As we touched on, specific prefabricated modules were used to build the volume, which has a rectangular floor plan. This made it quick to put up and economically viable without detracting from its attractive appearance. The classroom, designed for work with groups both indoors and out is structured in three modules - services, the actual classroom and the pergola for outdoor activities that in turn communicates with the pavilion interiors through a large opening. The team of architects from BCQ Arquitectura referenced the image of the classic wooden hut in the forest, not just for the formal lines but also in the choice of material. The gabled roof slopes inwards and has the specific practical function of collecting the rainwater from the roof that is channelled into a well alongside the classroom. Aula K is, therefore, a virtuous example that in its architecture incorporates sustainability criteria, focusing on issues like the materials used, the cycle of water, lighting, natural ventilation and local biodiversity. Because the pavilion is designed not just for human use but also to accommodate the local fauna. It is no mere coincidence that the designers integrated construction details such as birdhouses, an insect hotel and a bats' shelter in the modular elements of the façade. The way the pavilion connects with the natural backdrop is emphasised in the photos by Marcela Grassi who captured Aula K. Inaugurated just a few months ago, it has already become an important element in the context of Santa Coloma de Gramenet, a suburb of Barcelona on the south-eastern side of the Catalan Coastal Range and the ninth most populated city in Catalonia.